It’s not the most secret, but it’s a hell of a lot less crowded than a GC beach. Located in the beautiful heritage listed Enoggera reservoir in West Brisbane, Enoggera Dam is the perfect spot to cool down while the mercury is soaring. Boasting some picturesque scenery that resembles a European lake in the summer, the best bit is it’s only half an hour from the city, so blow up that inflatable flamingo and hit the road. This secret swimming hole is tucked away in the ‘burbs of Brisbane’s northside Hills District, making it perfect for a serene escape without going too far. There’s something for everyone here, with clear shallows for wading and deeper waters perfect for paddle boarding and kayaking. The Bunya Crossing Reserve is also doggo-friendly, so put your pooch in the car and get there ASAP. If creeks and dams aren’t your thing (one word …eels), then hit up Soleil South Bank’s gorgeous poolside bar. Go for a dip while you sip on tropical drinks for all the holiday feels, right here in Brissie. Customers of the bar are welcome to swim in the pool, so basically you HAVE to get a cocktail (that’s a good excuse, right?). So pop on your cutest bikini and cool off the classy way. This awesome little swimming spot is located just outside of Samford and is the perfect place for taking your togs and a picnic (and by picnic we mean a four pack of Drumsticks). With a lush green landscape and icy clear water, it’s easy to forget you’re only half an hour from the city. This stunning cascade waterfall in Mt Coot-tha is a little slice of dense hinterland rainforest only 10km from the CBD. The falls are surrounded by some beautiful bush walking tracks, so you can get nice and sweaty before you plunge into the water (but not too hard, this guy can get a little shallow if it hasn’t rained in a while). The grassy creek banks make this the perfect place for a Sunday barbie with your mates, so grab some snags and hit it up. 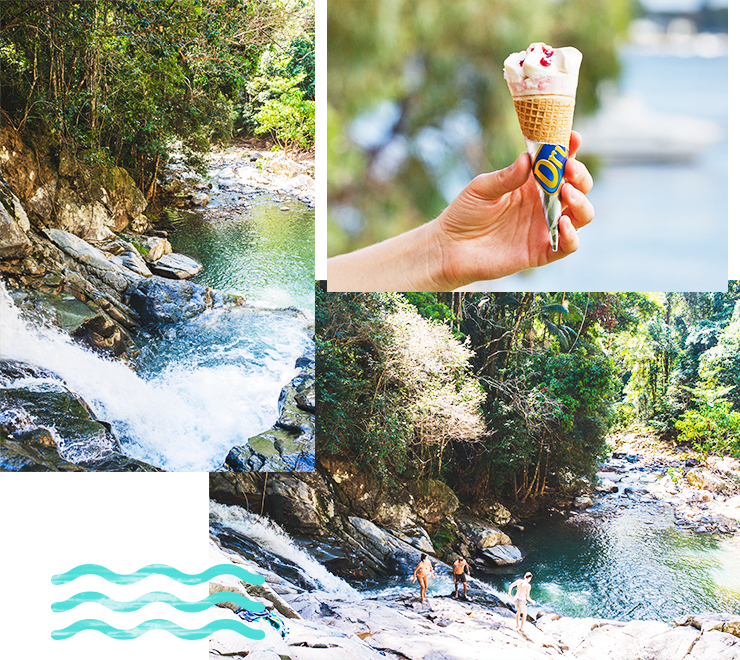 If you’re looking for a new place to cool off in, take a day trip to the Sunny Coast hinterland and check out Kondalilla Falls. Located just a few minutes from the quaint little town of Montville, Kondalilla Falls features a circuit track walk complete with plenty of swimming opportunities and Insta-worthy scenery everywhere you look. The falls are home to lots of cool wildlife, so have your camera ready. Often referred to as ‘Serenity Falls’, Buderim Falls is brimming with oh-so-zen vibes. Located in the tranquil Buderim Forest Park, the 600-metre walk from Lindsay Road to the falls is spectacular, so take in the scenery alongside the banks of Martin’s Creek, or, if you’re feeling adventurous you can bush walk to the high arch bridge from Quorn Close. Particularly pretty after rainfall, the falls are a total hidden gem on the Sunny Coast. While Currumbin Rock Pools seem to get most of the press, just quietly, the nearby Cougal Cascades in Springbrook National Park would be our pick. The cascades plunge off a small cliff face before spilling into a larger pool, and if you’re feeling adventurous you can slide along the rock into the cool, green water. The cascades are both wheelchair and pram accessible, although swimmers will need to go that extra step for a serious dip. If you’re up for a bit of a drive, check out Springbrook Twin Falls. Smack-bang in the heart of Springbrook’s beautiful national park, Twin Falls is a stunning swimming area with tranquil scenery and running waterfalls. Before you jump in, take a walk around the Twin Falls circuit track to get a better look at the scenery and wildlife—and remember to take a waterproof camera to get some ‘grammable snaps under the waterfalls! Mount Tamborine National Park is home to this picturesque cool-off spot, which is surrounded by damp eucalypt and scenery that looks like something out of a fairy tale, with enchanting flooded gum trees entangled in vines and moss. Take a short walk and find yourself overlooking the falls and the gorgeous rainforest. Keep your eyes out for basking turtles and native fish, and make sure you stay until dark when the glow worms put on a show!